In the last three decades of the nineteenth century, an American buffalo herd once numbering 30 million animals was reduced to twenty-three. It was the era of Manifest Destiny, a gilded age that viewed the West as nothing more than a treasure chest of resources to be dug up or shot down. Supporting hide hunters was the U.S. Army, which considered the eradication of the buffalo essential to victory in its ongoing war on Native Americans. Into that maelstrom rode young George Bird Grinnell. A scientist and a journalist, a hunter and a conservationist, Grinnell would lead the battle to save the buffalo from extinction. Fighting in the pages of magazines, in Washington’s halls of power, and in the frozen valleys of Yellowstone, Grinnell and his allies sought to preserve an icon. Grinnell shared his adventures with some of the greatest and most infamous characters of the American West—from John James Audubon and Buffalo Bill to George Armstrong Custer and Theodore Roosevelt. 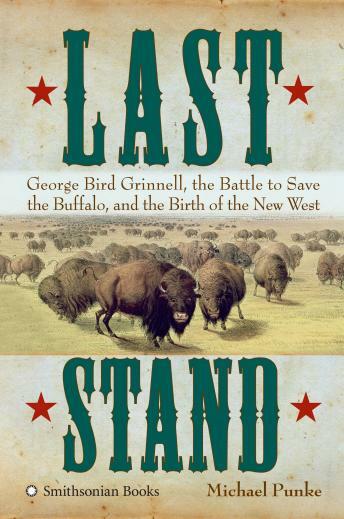 Last Stand is a strikingly contemporary story: the saga of Grinnell and the buffalo was the first national battle over the environment. Grinnell’s legacy includes the birth of the conservation movement as a potent political force.